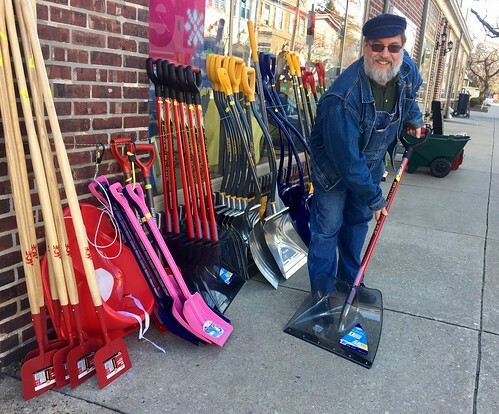 Ken Roberts of Kilian's Hardware Store gives a hands-on demonstration of the various snow shovels the store has leaning outside the store. There are ergonomic ones, some with bends in the handle, and another with a straight handle and an extra handle-mounted grip. Wide curved ones for clearing large areas of light snow. A narrower feed shovel type for digging out deeper snows without breaking your back. Steel edged blades for strength. Hard plastics and aluminum for lightness. Car shovels and, most useful of all kid-sized shovels. If you get the kids to shovel, you're halfway done, Roberts jokes. Watch demonstration here.